Adam Valavanis ’17, Jeanne Straus P’13, and Cassidy Taylor ’17 at Straus News in Chester, N.Y.
Cassidy Taylor ’17 (East Lyme, Conn.) came to Lafayette ready to major in international affairs because of her love of language and traveling. However, she decided instead to declare a double major in English and film & media studies. Taylor and Adam Valavanis ’17 (Glenwood, Md.) 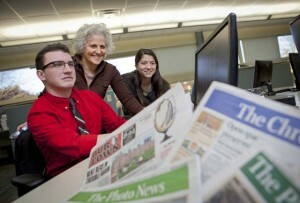 got a firsthand look at the journalism field during a four-day job-shadowing externship with Jeanne Straus P’13, president of Straus News in Chester, N.Y.
“I now have a bit of exposure to the journalistic world, and this will help me pursue this dream of mine,” says Taylor. Jeanne Straus P’13, Cassidy Taylor ’17 and Adam Valavanis ’17 peruse one of Straus News’ 14 publications. Straus introduced the students to the basics of a news room, from the gathering of story ideas to editorial meetings, reporting, photography, and publishing. She also gave them a look at the business side of Straus News, which publishes 14 local weekly newspapers and associated websites in towns in New York, New Jersey, and Pennsylvania. Categorized in: Academic News, English, Film and Media Studies, News and Features, Students, The Real Deal: Real Students. Real Athletes.